All classes are designed so you have a great time while dancing yourself into shape. Come and learn some steps that will make you feel alive. 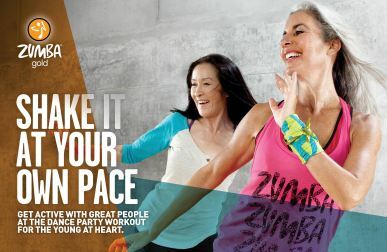 Zumba Gold® – Zumba Gold takes the Zumba formula and modifies the moves and pacing to suit the needs of the active older participant, as well as those just starting their journey to a fit and healthy lifestyle. What stays the same are all the elements the Zumba Fitness-Party is known for: the zesty Latin music, like salsa, merengue, cumbia and reggaeton; the exhilarating, easy-to-follow moves; and the invigorating, party-like atmosphere. It’s the easy-to-follow program that lets you move to the beat at your own speed. It’s an invigorating, community-oriented dance-fitness class that feels fresh, and most of all, exhilarating! Zumba Gold® classes provide modified, low-impact moves for active older adults. Zumba Gold is the perfect fit. It’s a dance-fitness class that feels friendly, and most of all, fun. « Yoga Classes Start March 22!